Dessert love! If I could marry any dessert that’s been on my lips this year, five-minute melt and pour Thin Mint Fudge would be my Mister. Wowee is it incredible. 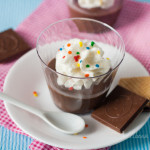 Smooth, rich chocolate fudge with crunchy cookie bits and hints of mint. Watch out skinny jeans, you might just get shoved toward the back of the closet this month. I’ve been using this foolproof chocolate fudge recipe for years. In fact, I cut it out of a teen magazine way back in high school and it’s still the best easy fudge recipe ever. No candy thermometer necessary. While this chocolate fudge recipe is outta this world on it’s own, Thin Mint additions make it even better. Last month I taught you how to make fab copycat Girl Scout Thin Mint cookies. This week we’re putting them in fudge. How ’bout that to rock the socks off your holiday gatherings? Use one tablespoon of butter to grease a 13x9" baking pan. Place a medium saucepan over low heat and melt 1 tablespoon butter. Add the chips and condensed milk. Stir constantly until mixture is completely melted, approximately five minutes. Add peppermint extract and stir in Oreo pieces. Stir to incorporate. Pour mixture into prepared baking dish and spread evenly. Cover and cool. Store in fridge. Jelli, this looks amazing! My husband was reading over my shoulder and kept hinting at how much he would love some of this right now! Haha, my husband reads over my shoulder sometimes too- especially if he sees yummy food photos! Hope you give the Thin Mint Fudge a whirl. It’s almost too easy not to. My kids would love this! Can’t wait to see more of your recipes! Tara, don’t be fooled! Fudge is definitely addictive for even the 100 year-old kid. Hope your family loves it. These look amazing. Chocolate and mint is my favorite flavor combo… I can’t wait to try these. Oh, my. 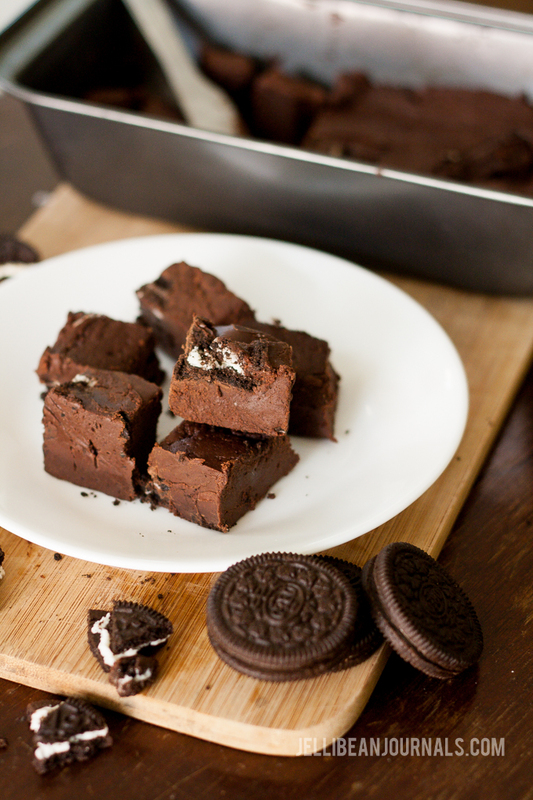 This fudge looks amazing! I completely get where you’re coming from, Alli. I can’t even count how many pieces I ate of that first batch of Thin Mint Fudge. Waaaay too tempting! Hope you give it a try sometime soon. Oh my goodness, yes please! This looks amazing, and sounds so easy! 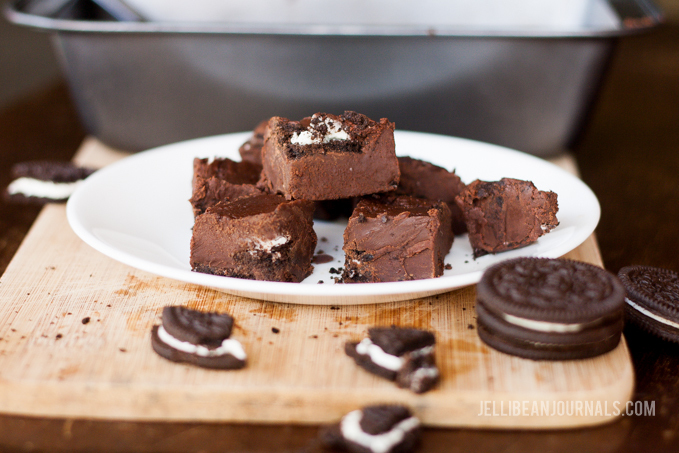 I love fudge, and I love Thin Mints, so this has to happen in my house! Fantastic. I love fudge, I love chocolate and mint – so this is perfect. I’m printing it out straight after writing this comment, though my waistline won’t thank me! Your tastebuds will be sure to praise you so loudly you’ll never notice the extra Thin Mint Fudge heading to your hips. 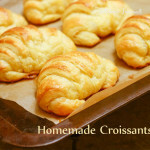 Enjoy the recipe, Sarah, and be sure to stop by again and give me your feedback! I’m sorry to break it to you but you can’t marry this dessert. See, we are actually in love and I have already proposed. 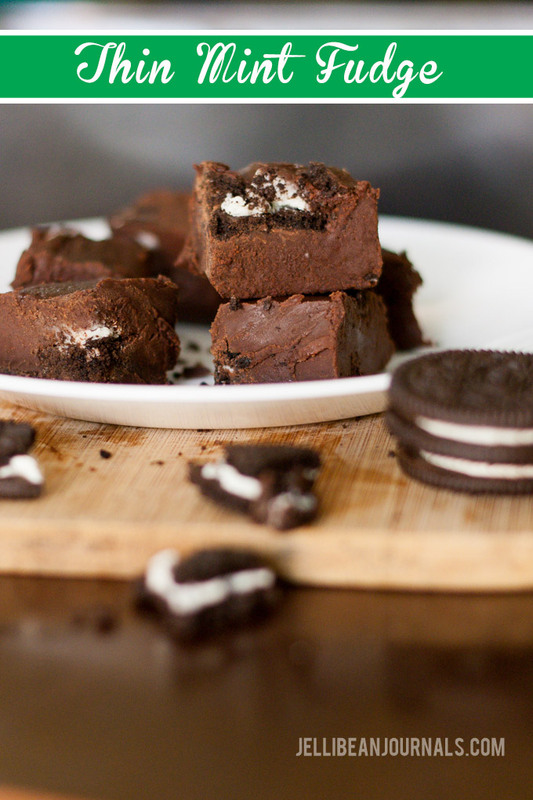 Oreos and fudge go together like me and Oreos and fudge. Haha, you’re a riot! 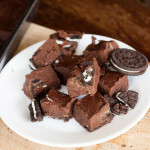 Hope you try the Thin Mint Fudge and stop by to let me know what you think. We always make a big batch of fudge for Christmas. Love your recipe and now that you made me drool, I will have to see if I can convert it to gluten free 🙂 Have a great day! Do they make GF Oreo cookies? I’m sure there’s some company out there pumping out delicious GF chocolate sandwich cookies. Hope you give it a try, Ali. 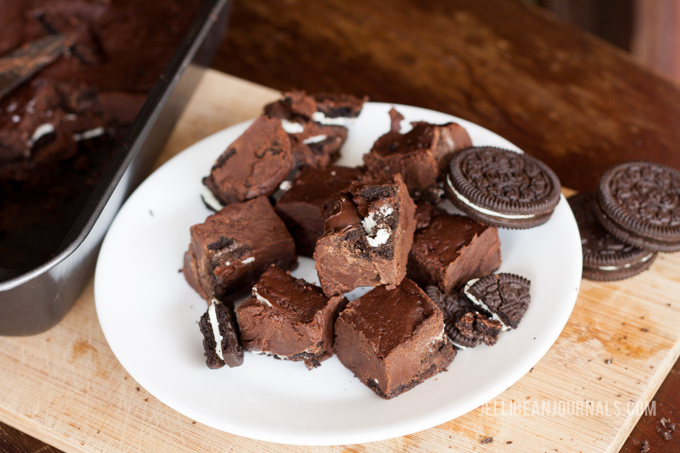 This fudge looks wonderful! Cannot wait to try it! Oops, I forgot I am on a diet:) Oh, well, going to try them anyway! Thanks for the recipe. Printed and ready to add to my recipe binder! I would love to try this recipe! Any fudge recipe is sure to be a hit in my house! These look soooo good! Thanks for sharing…I need to run out and get some peppermint extract to make these 🙂 thanks for sharing! If you’ve got peppermint essential oil in the house, a couple of drops will work in a pinch too! Hope you do make the Thin Mint Fudge this weekend and find it even better than your wildest dreams! Be sure to stop by and let me know what you think! This looks absolutely delicious! And you can never go wrong with chocolate. We might try this over the weekend. I never liked skinny jeans anyway! Hand over that plate please of deliciousness please! I’ve never made fudge before, but willing to give something new a try this year! You know, I never have had skinny jeans per se either, Heather. If you like chocolate, definitely try this melt and pour fudge. You’ll be head over heels! Oh my boyfriend would definitely love these! Maybe I’ll make these for him soon! I’m not a huge mint fan but my husband is. He would love something like this. Thanks for the recipe. Oh my goodness! This looks and sounds amazing! I have to make some of this! Thanks for the recipe! When I saw that first picture my head kind of exploded. These look amazing! Will do nothing for my figure but will make me sooo happy! oh my GOD.yammi yammi.cant wait to try this.i have eaten once mint fugde in an resturant and it was so delicious. 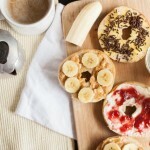 Oh my these look and sound so yummy! 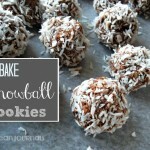 I will be making a big batch of these for my family around the holidays for sure! GAH! It may only be 8 am, but this needs to be in my hands right NOW. Looks so amazing! Definitely a great recipe for the holiday season! Great minds think alike. Pretty sure I sneaked a piece of this even before I had my morning coffee! 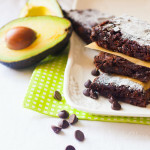 So so good… and I’ve got even more choco-mint bliss recipes heading your way soon. Stay tuned! I’d definitely love to sample your bakings. Haha, thanks so much for the kind words, Colette. Now that I know how to make my own Thin Mints, I’ll still keep the scouts in business during sales season, but I’ll be able to keep the pantry stocked even when my stash runs out! Thank you so much for taking a moment out of your busy day to visit. 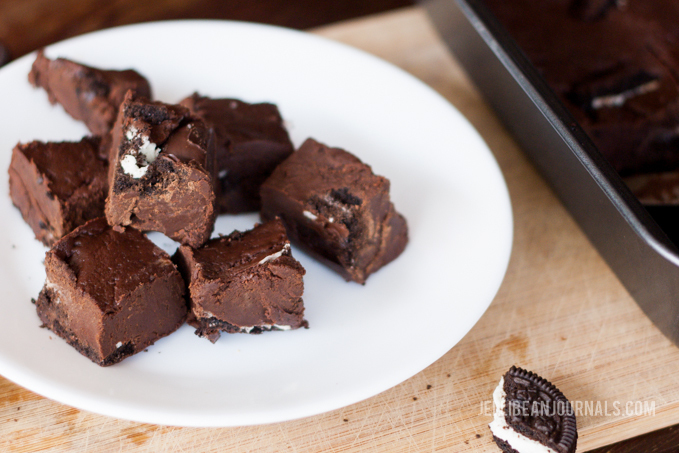 Fudge is my weakness and I love that you made a thin mint version. with Oreo chunks in there! It looks so decadent and delicious! Love how easy this is to make too! Thanks so much, Kelly. I can’t even count how many pieces of this stuff I stuffed in my mouth before sending a plateful to the neighbors. When it comes to Thin Mint Fudge, I’ve got zero self control.